It was the early eighties and my choice of music was not just progressive rock music. Being a fan of guitar music, Van Halen and Michael Schenker's solo work had entered my world, and so did a new band from the USA; Night Ranger. Pure melodic rock with two vocalists; bass player Jack Blades and drummer Kelly Keagy, seconded by two out of this world guitar players. I loved the two hand tapping of Jeff Watson and the dive bombs of Brad Gillis. The latter was offered a job by Ozzy Osbourne at the time, but preferred to remain at Night Ranger. Night Ranger's line up was completed by keyboard player Alan Fitzgerald's dedicated sound. Over the years, the whole melodic rock scene was flooded with less interesting bands that preferred looks and attitude over high quality songs and honest “rocking” and therefore my interest in the genre slightly faded. Nevertheless, I kept checking the melodic rock scene from the sidelines for new releases that might be of interest. That's where Frontiers Records comes in, this label kept believing in the music of the top league of melodic rock, releasing many wonderful records and basically keeping the genre alive. This album perfectly fits the picture. Now we celebrate the band's 35th anniversary with a very special album, called 35 Years And A Night In Chicago. Night Ranger's line-up has seen some changes over the years, but the core of the band has been working together over the last two decades. So on this nostalgic, high quality album, we can witness how Jack Blades, Kelly Keagy and Brad Gillis have aged and welcome both guitarist Keri Kelli and on keyboards Eric Levy, with the group for one and five years respectively. 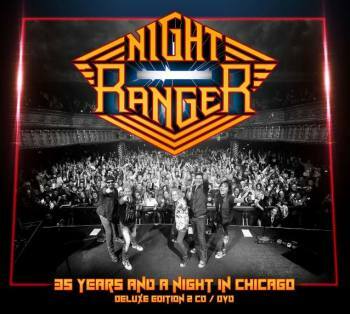 Musically Night Ranger still excels and remains the high quality band I was hoping to see. Sure, some of the vocal parts are a bit harder for both Jack Blades and Kelly Keagy, but both of them succeed in reproducing the original feel of the albums I cherished so much. Songs like the smoother Goodbye and Sister Christian still touch the audience, especially the latter being a real crowd pleaser. On the other hand the band performs all their classic songs, focusing on the very successful years in the beginning of their career. Touch Of Madness, The Secret Of My Success, Rumors In The Air , Eddie's Comin' Out Tonight, Don't Tell Me You Love Me, When You Close Your Eyes and Night Ranger are played with the same enthusiasm as thirty years ago, highlighting the lead role of guitarist Brad Gillis. Second guitar player Keri Kelli does get to play a number of solos and gets his fair amount of guitar duels, but guitar wise the show is focussed on Brad's immense playing. To make the recording special, Night Ranger performs a brand new song; Day And Night that they had recently written and will be featured on their forthcoming new album. Not breaking the tradition, Night Ranger closes with their anthem Rock In America ending a very entertaining show which shows the spirit is still alive after thirty-five years. The CD version, which holds two discs ends here, where on the additional DVD/BR the song Seven Wishes serves as a bonus track. For me listening to both CDs brings back memories of when I was a bit younger, but the real fun comes when you watch the very well recorded DVD. The impeccable performance is a real treat to watch. Time to rate this album, I guess to me the album has to be awarded the maximum amount of stars, just for the whole nostalgic trip and the absolute brilliant performance. But to be clear to the die-hard progressive rock fans, this is pure melodic rock, the best you can get. And I love it.